What are the Highest Paying Welding Jobs in US for 2019? →What are the Highest Paying Welding Jobs in 2019? As an occupation, welding comes with a great deal of satisfaction. But it is also a highly competitive trade which requires those considering it to weigh their options carefully. What follows is a description of the highest paying welding jobs available. We will discuss the hazards, the benefits, and the pay ranges for each to help you make a more informed decision. A Blue Grass Chemical Agent-Destruction Pilot Plant pipefitter welds piping for the Munitions Washout System. long as the demand for fuel and other resources is high. Many pipe welders work on oil rigs and refineries. These facilities comprise the majority of the oil and gas industry. Pipe welder keeps it all together, as he welds piping for the Munitions Washout System. Pipeline welders are also needed in the automotive industry, shipbuilding, nuclear energy, aerospace, and fabrication, not to mention the armed forces. Often times, work areas in hard to reach locations. In addition to learning how to lay down high-quality welds, welders working on industrial pipes must master the application of their craft while working in difficult positions. The national average Pipe Welders salary range from $33k – $38k/yr according to salaryexpert.com. On payscale.com your Market Worth would be 51k/yr and on glassdoor.com it’s $44,635/yr. JINHAE, Republic of Korea (March 15, 2016) U.S. Navy Builder 2nd Class Jesus Saucedo Gomez (right) with Underwater Construction Team (UCT) 2, performs an underwater fillet weld. 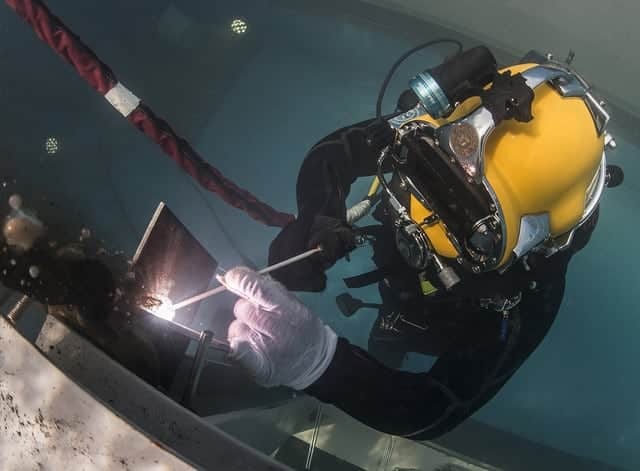 Easily one of the most dangerous activity a welder can do, underwater welding is also among the most secure and highest paying job out there. Underwater welding comes with special compensation for the added hazards that come with working underwater. In addition to the obvious dangers, these tradesmen also have to cope with barometric pressure. Despite all this, many underwater welders enjoy the challenge and travel, as well as the surreal working conditions. 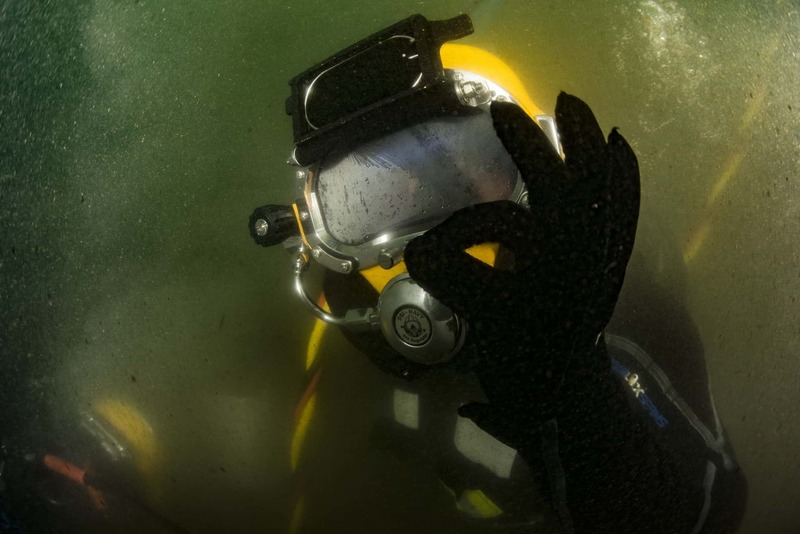 Underwater welding comes in two forms, wet welding, and dry welding. Wet welding is done while the welder is submerged, either partially or completely. Specially designed welding rods are used to make this possible. Dry welding or hyperbaric welding means welding in a sealed chamber that is submerged. The hyperbaric chamber encloses the welder and the material to be welded. It is filled with helium or argon and oxygen to force the water out, allowing the welder to do his work. Underwater welders are required to undergo an extensive course of training. This education includes diving proficiency, which comes with a whole range of required skills as a professional welder. Aspiring underwater welders must pass a series of stringent performance and knowledge tests to earn their underwater welder certification. Skill sets required include SCUBA diving, top side welding, and underwater welding. Welding is a terrific skill set to have and will continue to be much-needed for many years. Welders will be needed to work in difficult to reach places, low volume fabrication, and repair. Many functions of welders will remain too complex to automate. Machines have been built that can perform many welding tasks, but working in unpredictable environments and making difficult decisions will require a professional human welder for the foreseeable future. In construction, a certified welding technician will regularly encounter a variety of metals and various situations which require their specialized expertise. Welders monitor an automatic welding machine used to weld seams of the Fire Water Storage Tanks at the Blue Grass pilot plant. Contractors and employers will expect the tech to be well-versed in the latest developments and technology within the field and able to apply it. A welding technician typically works in construction or assembly work. He or she must make critical decisions involving the type of welding techniques, equipment, and processes to be used. The need for certified welding technicians will continue to increase, making this career path a secure job opportunity with good pay. Pay by Experience for a Welding Technician is on an upward trend. An entry-level certifiedWelding Technician with less than 5 years of experience can expect to earn an average total compensation of $51 – $62(in thousands) based plus bonuses, overtime pay and tips. As we have mentioned, above average paying welding jobs requiring extensive travel, work in remote locations, and those involving hazardous conditions almost always offer the best pay for welders. How about some welding in the Land of the Midnight Sun? Alaska is a great place to start your welding career, even if you are just out of the welding school. For example, Shipyards constantly offer jobs for welders. In a Shipbuilding and repair business, novice welders can learn new skills quickly and those with Journeyman’s level of skill can expect a fine salary. The big plus of this state is a steady economy with constant growth for the past 20 years. It’s one of the safest places in the US right now to move in and build your future. Welders here have the benefit of a thirty percent pay hike for working outdoors in the winter. Granted, that paycheck will be earned as Alaskan winters are anything but mild! It can get down to fifty below, but it isn’t always cold! Summer in Fairbanks can get up to ninety degrees Fahrenheit. Also, there is a perk of 20% to 30% bonuses on winter working conditions. Alaska’s wilderness is breathtaking. Artist Bob Ross was stationed here. If you ever wanted to see the “happy little trees” in person along with America’s most majestic mountains, Alaska is the place to go. Depending just how far north you live in Alaska, you may experience periods during the equinoxes where you have either eternal night or eternal day for a few months. And then there’s those Northern Lights. Yes, you could be able to see the Aurora Borealis from within your kitchen! $65,610 – Average yearly salary by Bureau of Labor for Alaska. The Average hourly wage is $12.37 – $38.13 with $44.22 for overtime. North Dakota has been known for its low cost of living compared to other states. Plus, it has a growing oil business that’s bringing in many opportunities for people seeking jobs as welders. North Dakota heads a great many state economic rankings due to its oil boom. Despite what you may gather from the crime drama Fargo, North Caroline is a fairly safe place to live. Crime rate is low, but road conditions can get hazardous in the winter, so pay attention and stay safe. The blizzardy winters can get down to sixty below. If you like nature trails, free roaming bison and learning about Native American cultures, there are historic sites and national parks that will accommodate you. North Dakota is proud enough of its welders to hold welding competitions. Fargo hosts a Behind the Mask welding competition every year for welding students. It’s a great way to get yourself out there and attract someone looking to hire. The Average hourly wage is $18.27. This is ten percent above the national average. According to John Denver “Life is old there, older than the trees.” West Virginia is almost Heaven but its country roads aren’t as old-fashioned as you think! West Virginia has booming aerospace, automotive and energy industries; all of which require skilled welders. This means above average salaries for welders. There is also a booming oil and gas industry in the state that offers a lot of jobs for pipe welders and fitters. The cost of living here is rather low, which means that paycheck will go pretty far. Autumn and summer are the best times to be in West Virginia with plenty of outdoor activities and breathtaking scenery. West Virginia is a state that is abundant in natural resources and up to date with technological advancements. Anyone looking for a career in chemicals, biotech, energy, aerospace or automotive would do very well here. A welder starting out in West Virginia can expect to earn around $12.42, or about $25,840 annually when working full time. More experienced welders can earn around $35.93 per hour, or $74,730 full time. This range can depend on certification, experience plus type of position. The median wage for a West Virginia welder is $18.86 per hour. That adds up to about $39,230 per year. Here is the land you know about from Hawaii 5-O, Magnum P.I. and the Disney film Lilo and Stitch. The tropical Aloha State has only two seasons with regional names. From May to October, the kau season averages eighty-five degrees Fahrenheit. From November to April, the hooilo season averages about seventy-eight degrees Fahrenheit. This is a great place for outdoor sports but always heed the weather warnings! Volcanic fog may sometimes form when sulfur dioxide and other gasses from Kilauea’s Halemaumau Crater blend with the air and sunlight. Heed weather warnings concerning this as well. Also, do not attempt to take a selfie with lava that’s coming right at you. It’s not the good idea you think it is. There are 16 Offshore oil drilling companies in Oahu, HI. and all of them have offshore oil rigs and welders are needed on all of them. Because of Hawaii’s tropical location and deep ocean connections along with the Hawaii Clean Energy Initiative the state is very attractive to the commercial development of OTEC projects. The Average hourly wage is $27.97. This can start at $17.75 and go up as high as $37.69. Wyoming has long been known as the land of the cowboy but it’s also a progressive land. It was the first state to have a national park, the first to have a national monument, the first in women’s suffrage and first state to have a woman to be elected governor. The winters are cold and harsh but the people are warm and kind. The same diverse natural history that makes Wyoming an ideal spot for geological and paleontological research and study also makes Wyoming a location with full and vast amounts of different energy creating natural resources such as coal, natural gas and crude oil. The state’s natural resources make it so that Wyoming supplies more energy to America than any other state in the country. Wyoming has an energy extracting industry from coal to oil. The manufacturing industry is growing which results in more job for welders. The low population means there’s plenty of jobs to go around and light traffic on your commute to work. The Average hourly wage is is $27.59. It starts at$16.91 and can go up as high as $41.66. It’s said that Las Vegas is actually one of the least expensive vacation spots in North America, provided you can control yourself in the casinos. Much of Nevada is desert and sees on average only seven inches of rain annually. Much of the state is in the Great Basin. Even the Mojave Desert covers a bit of southern Nevada. But it isn’t hot everywhere! Nevada means “snowy”, referring to the mountains where you’ll find many ski resorts. Nevada’s leading industries also include manufacturing and mining/oil which all require a lot of trade jobs and welders. Since the economy is improving and the industries are growing so is the need for welders. Military Welder Working On A Bridge Construction. With America’s military heavily engaged overseas, there is a definite demand for skilled trades in all four branches of the Military, particularly for welders. The pros of working for the military are guaranteed benefits, good pension and healthcare, opportunity to travel and a secure job. To enlist in Military as a welder you will have to pass a thorough physical and mental examination. Fear not because there are always high-demand Military Occupational Specialties (MOSs). When you pass all the test you will be sent to Allied Trades Training. The training lasts around 19 weeks and on it, you will also learn machinist skills that will come in very handy when you go back to a private sector. The salary is not huge but there are other benefits besides a safe job that make up for it. Ability to Earn Credentials in GMAW, SMAW, flux cored arc welding, GTAW, and oxyfuel cutting/plasma cutting. Education benefits, like Tuition Assistance that allows a person to receive up to $250 per credit hour to take college classes. Then credentialing programs, like further AWS and NIMS certifications. you can even become AWS Certified Welding Inspector. The best thing about these benefits is that soldiers who serve honorably are going have access to the Post 9/11 GI Bill. And benefits in this bill can be transferred to your family members. Pay will differ a lot depending on the state, certification, skills and the branch of the military. Welders work is an exciting and challenging trade that requires a lot of dedication from its practitioners. The travel, unique job sites, and good pay makes it a very appealing job for those whose demeanors suit it. If you intend to go into professional welding, keep in mind that it requires a high level of skill and personal fortitude. Successful professional welders are highly respected for their toughness, problem-solving abilities, and resolve. Anyone hoping to make it in this trade must be ready to go above and beyond the demands of the ordinary workplace.